Guttatus means spotted in latin. 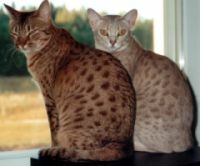 Ocicat is usually a spotted cat, but occasionally also so called classic tabby ocicats are born - like our Typy here beside. The spotted cat resembles a wild jungle cat, but a tabby cat charms everybody with the strong pattern of the coat. The breed got its name ocicat because it looked a lot like ocelot. The Ocicat (OCI) is a spotted cat resembling the big cat of the wild, but without the wild ancestry. It is bred for the beautiful spotted pattern that is so necessary to fulfill its wild looks. The OCI is a muscular breed, and it weighs more than it seems! 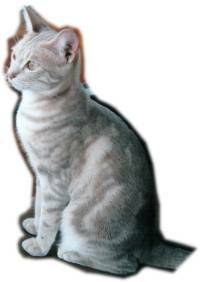 Our first ocicat is Moona, alias IP Galax Moonlight Serenade. She has also nicknames like "oci-bunny". Our very first litter was born on the 4th of March 2000. The lady was Wanda, who sitting in the right side of Moona in the picture. Our first breeding queen Wanda gave birth the the second litter in this year on the 25th of September. Please, visit our kitten pages to see more information the kittens. What is an Ocicat like? The nature of an ocicat is one of the kind. They are very social, sometimes even too social. They are following you where ever you go at home: they will read and teach you how to read newspaper. Washing the dishes is also a great jow for the ocis eventhough they just might get a bit wet with it. Writing with a pen is almost impossible when an oci is around. The cursor of the mouse in the screen of a computer drives ocis wild: they are chasing them from the screen - like it was really a mouse.